Oh how time flies when you’re having fun! Today the classic Mega Man X celebrates the 25th anniversary of its original Japanese release in December of 1993. To celebrate, it felt only appropriate to revisit the review I did for the classic game back in 2016 as my first article for GameTyrant! My review of Mega Man X wasn’t the first review I ever did, but it was the first I ever published. But, I think I have gone on long enough, here is my updated and revised review of Mega Man X enjoy! Mega Man X is an action platformer from Capcom released on the Super Nintendo Entertainment System in the United States in 1994. In the years since ‘94 Mega Man X has been subsequently released on DOS computers, Nintendo GameCube, Sony PlayStation 2, IOS and even a remake on Sony PlayStation Portable. Various emulated ports have also appeared throughout the years on Nintendo’s Virtual Console service for the Wii, Wii U and 3DS. Most recently Mega Man X has seen a re-release in the form of the Mega Man X Legacy Collection 1 for the PC, PS4, Switch and Xbox One. From the first sounds of the Capcom logo to Dr. Cain’s computer and the main menu theme, Mega Man X pushes the nostalgia to 11. But what about this retro classic keeps bringing players back to relive it? Mega Man X tells the story of a new breed of robot known as reploids. X, the last creation of Dr. Thomas Light, was the first reploid created. Fearing the abilities of his creation Dr. Light sealed X away. After an undisclosed amount of time Dr. Cain, another robotics inventor, discovers X in the remains of Dr. Lights lab. Realizing X’s advanced abilities, Dr. Cain has reploids mass produced to better humanity. Because reploids can think and feel and grow like humans many became prone to criminal behavior; these reploids become known as Mavericks. Eventually, an elite reploid force known as the Maverick Hunters is established to put a stop to Maverick activities. Dr. Cain creates Sigma, a reploid with systems immune to Maverick behaviors, to lead the Hunters. One day, the unthinkable happens and Sigma turns Maverick and takes over an island with eight of his strongest reploids. Feeling responsible for Sigma’s betrayal, X joins with the new leader of the Hunters, Zero, to take on the threat of Sigma and his Mavericks. Mega Man X builds on the gameplay of the previous six Mega Man games released on the Nintendo Entertainment System. The basics are all here: run, jump, shoot, get the weapons from the eight fallen stage bosses, and then head to the final showdown with Sigma. 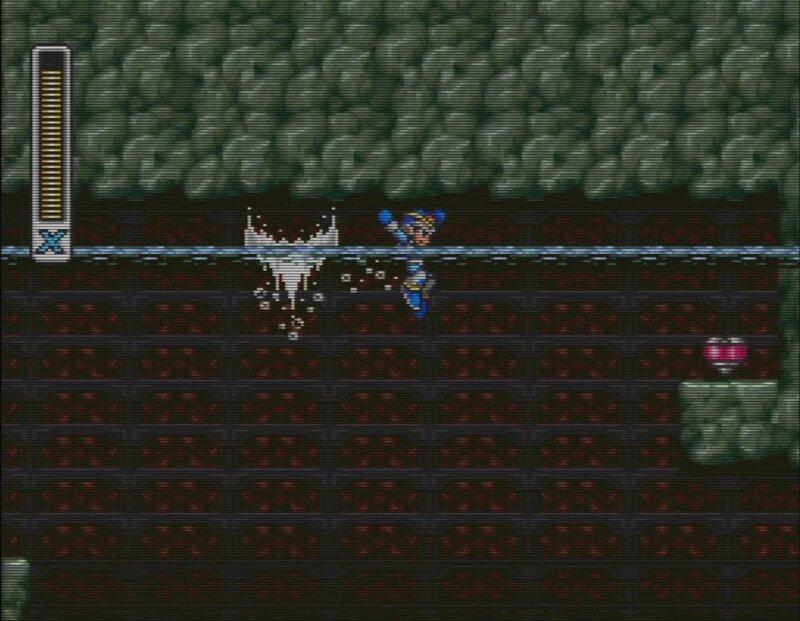 New mechanics introduced with Mega Man X include hidden body and health upgrades hidden in certain stages. One of the new upgrades is a dash ability, which significantly speeds up gameplay. Mega Man X also introduced a wall climbing mechanic which added a new sense of verticality to stages compared to their NES forbearers. Over the years both new mechanics have been used to find tricks or been exploited by players in interesting ways for players to beat the game faster, making this game fun to watch speed runs of if you’re into that sort of thing. Stages also have a dynamic element which changes the way they play based on what order you beat them in. Beating Launch Octopus adds water to Sting Chameleons stage. Beating Chill Penguin freezes the lava in Flame Mammoths stage. If you are having difficulty beating a certain stage, try to beat others and come back to the one you were stuck on; something may have changed! For you Easter egg hunters out there Capcom also hid a fun Street Fighter reference for you to find and exploit! Being a 16-bit era game the graphics are dated by today’s standards. Even compared to other SNES games of the time the graphics are nothing to write home about. Sprites are pixilated but show off the retro charm and colors that made the era great. Backgrounds likewise are interactive and colorful. Each of the enemies have their own unique look and bosses got to show off how much bigger SNES game sprites could be compared to those on the NES. Some level enemies even make a return from the prior Mega Man games in new 16-bit glory! However, thanks to the release of Mega Man X Legacy Collection 1, players can finally experience this game in a newfound clarity that has never been officially released before now! The sound quality in Mega Man X is top notch. Each level has its own distinct and catchy song, Storm Eagles stage theme being a personal favorite. Sound effects are also extremely crisp; shooting, normal shots and charged, dashing, jumping, damage and explosions are all very distinct. Some levels are unfortunately affected by too much reverb which does detract from the overall quality of the sound experience. 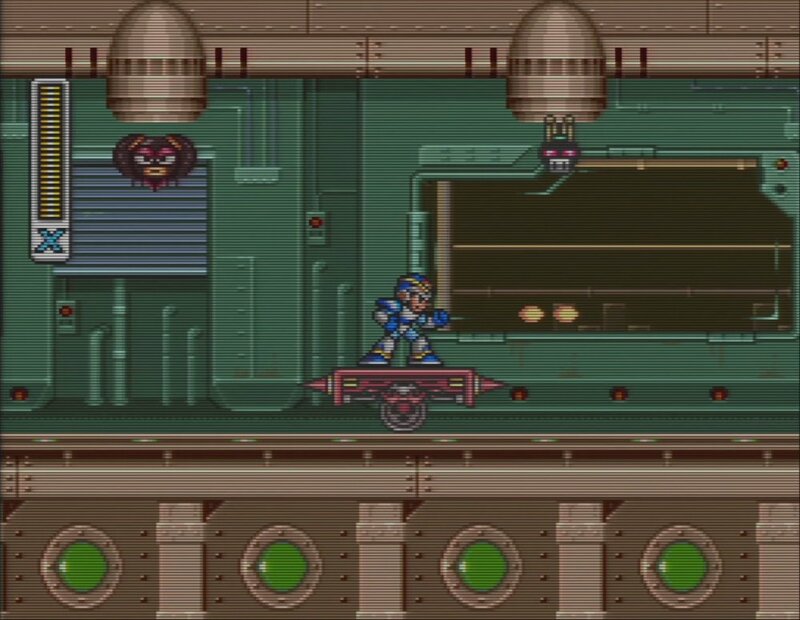 The reverb effect is not present in the GameCube and PlayStation 2 version of Mega Man X but is included once again in the later Mega Man X Legacy Collection 1. Mega Man X represents a revival in an aging formula that resulted in a great success. Spawning 7 more games and an RPG spin-off, many would argue that Mega Man X has even become more popular than the original Mega Man franchise. Despite some levels being a little less exciting than others, Mega Man X delivers on every other aspect. Top notch gameplay, charming graphics and an all to 90’s Capcom sound design really makes for an approachable game that anyone can enjoy. Even 25 years on from its original Japanese release! Mega Man X is and always will be a retro classic for me and one of my top five favorite games of all time. If you haven’t ever experienced Mega Man X, go give it a shot and see what you think! TL:DR Go play this game! Alright, I convinced you, huh? How can you play this game?! Mega Man X has been released on numerous platforms and each has its positives and negatives. SNES (~$25) – The original version of this great classic, but prone to lag. Wii U Virtual Console ($8) – Identical to SNES but graphics are filtered which results in a slightly more blurred look. GameCube/PlayStation 2 (~$45/~$10) – Includes X 1-6, a new save function, and lag has been eliminated. Graphics are filtered which results in a slightly more blurred look. Audio reverb has also been removed from X 1-3. PC/PS4/Switch/Xbox One ($19.99/$39.99) A new compilation of Mega Man X 1-4 that features numerous extras including the Day of Sigma prequel video from the PSP version Maverick Hunter X. This version provides the sharpest looking graphics but lag has been reintroduced to preserve the feel of the SNES original. This version can have more input lag than other releases depending on platform of choice with the Xbox One X being the least offender. can be purchased digitally alone or physically bundled with all 8 X games. IOS ($5) – Barely better than DOS, gameplay-wise, but graphics are remastered. PSP (~$10) – Complete remake of the original with new 3D graphics, cut scenes, and stage layouts. This version is not covered in this review.